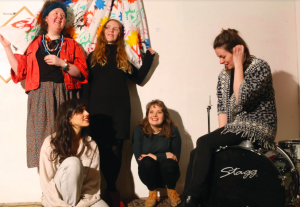 The term supergroup probably conjures up as many, if not more, negative connotations than positive terms, but at the very least, it’s not wrong to call Hairband a Glasgow super group. If you haven’t had the pleasure of catching them so far, October 2018 is likely to be the month that changes. If you were compiling a list of great nights out, Saturday evening in the Barras would be close to the list of perfect ways to spend your time. On Saturday 27th October, the Glasgow act supports Sleaford Mods, a chance to become familiar with loftier surroundings but with a CCA support slot on the 16th, on a bill with Say Sue Me from Korea, and their EP launch; the group should be road-ready for the two gigs supporting one of the most important bands of the modern day. There’s also the small matter of the band’s debut 12” being released by Monorail Records on the 19th of October. A Glaswegian music institution giving a relatively new name a leg-up but it’s no act of charity or nepotism, it’s an endorsement of a band with an interesting sound and something to say. Bubble Sword has been trailed from the self-titled EP and it ticks all the right boxes for fans of wiry guitar and rhythms that get you out your seat. The Television references in other reviews are well-placed but if you’ve struggled to find a band that fills the Electrelane shaped hole in your heart, this is a record to listen out for. Having already witnessed the band live, an early support slot for The Warlocks at Nice N Sleazy’s, it’s great to see the act traverse so far and yet, October 2018 looks to only be the start for Hairband.